And so, after almost two days touring around Songkhla City and Ko Yo, it was time to head home. With time in hand, I decided to take a scenic route. To be honest, almost anywhere in Thailand is scenic, but the smaller roads have far less traffic. They take a little longer, but the reward is in being able to enjoy the view. I decided first I would check the beach area that runs along the main road, but which isn’t visible without a small detour. 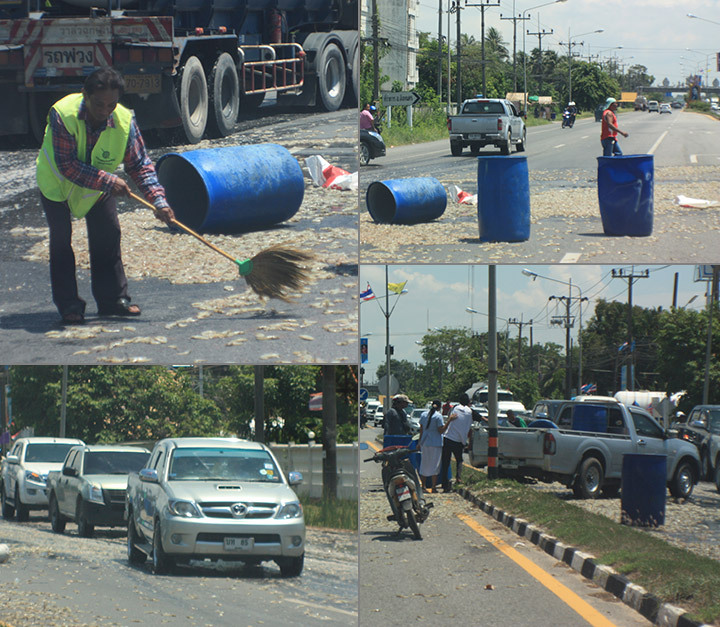 And after that, I found a way that crosses Lake Songkhla, leading eventually to another main road to the north. That cross country route was pretty, but nothing struck me as photo-worthy. Here’s some beach photos for you though. Note, as usual, the throngs of tourists! After rejoining the main road I found myself in a traffic jam. Eventually I could see this had been caused by a pickup truck wrapped around a lamp post in the middle of the road. That wasn’t the main problem though. The road had been blocked on both sides by shrimps! Tens of thousands of them, that I assume had been in some kind of containers on the back of the truck before it did its median-jumping act. 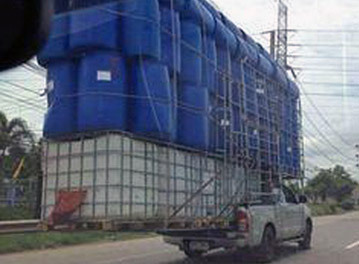 Thais love to overload their trucks. The pic on the right is typical. And once overloaded they’re difficult to control. Anyways, men with brooms were trying to get the shrimps into some kind of order, while we all tried found ways to avoid both men and shrimps. What amazed me most is that this happened right outside a police station, and there wasn’t a policeman in sight! I guess they’d just had a fresh delivery of donuts. The only other thing to block my route were these ducks, about 1km from home. I had to wait for a while before they decided just which way they wanted to go. So, on reflection, it was a good trip. I figure two days was about right to visit almost everything there is to visit. I know I missed a few things, but that’s okay. If I find myself in the area again, I’ll still have something new to see. Part of the problem touring anywhere in Thailand is figuring the exact location of anything. The tourist guides tell you what you should see, but don’t tell you where to find it. Other people’s blogs can be helpful, but only to a point. 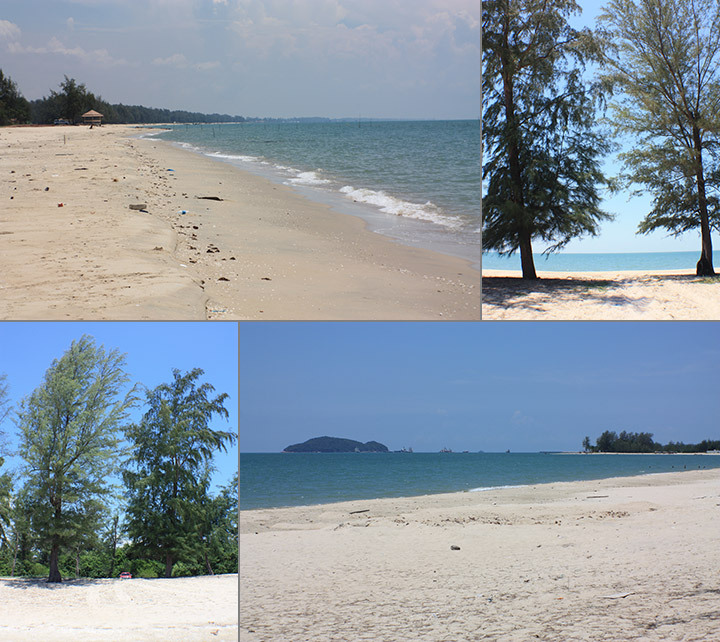 Sometimes I feel I spend more time researching a trip than actually making it, and Songkhla was no exception. But that’s okay, it’s part of the fun. Anyhoo, I’ve been home for a few days now. Feet are itching. Where next?